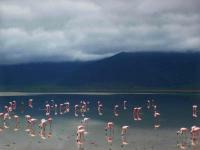 Here in Ngorongoro, the flamingos spread across the lake’s low waters, walk erratic steps and peck the mud with greed. Reflections of the flamingos and of the sky, punctuated by clouds, paint the water in blue, rose and white. The wind disperses the clouds ceasing their self-admiration on the mirror; the afternoon is going to heat up. In northern Tanzania, West of the Kilimanjaro and on the way to the famous Serengeti National Park, exists one of the bigger cauldrons in the world: the Crater of Ngorongoro.